470 Firearms, Scopes and Ammo. ; Bobcat 773 & Attachments, Tractors and Machinery; Vehicles and Trailers; Hobby Tractor, Ranch, Yard and Shop; Buggy and Horse Trailer and Tack; 100+ Outboard Motor and Vintage Chainsaw Collection; Bobcat 2200 Side-by-Side and Sporting; Antique Furniture and Glassware; Coins, Jewelry and Dolls; Vintage Player Harmonica and Other Toys and Books; Primitives; Etc. 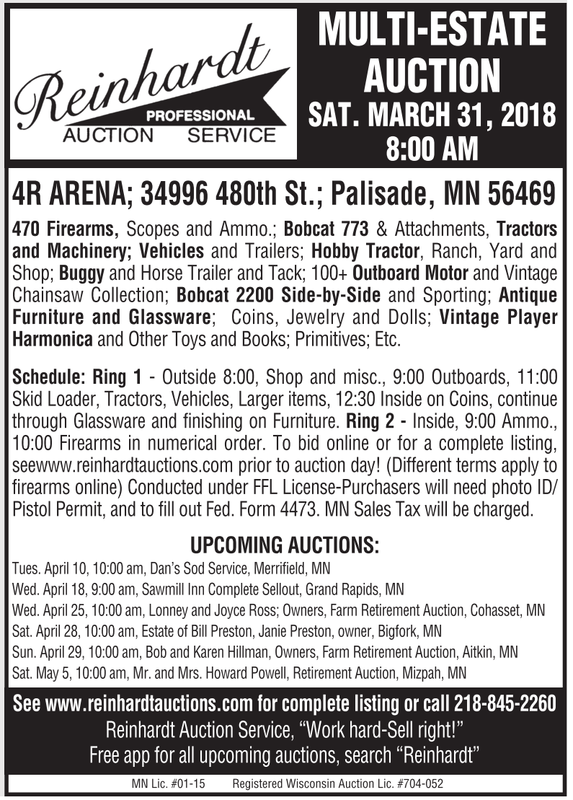 Schedule: Ring 1 - Outside 8:00, Shop and misc., 9:00 Outboards, 11:00 Skid Loader, Tractors, Vehicles, Larger items, 12:30 Inside on Coins, continue through Glassware and finishing on Furniture. Ring 2 - Inside, 9:00 Ammo., 10:00 Firearms in numerical order. To bid online or for a complete listing, seewww.reinhardtauctions.com prior to auction day! (Different terms apply to firearms online) Conducted under FFL License-Purchasers will need photo ID/ Pistol Permit, and to fill out Fed. Form 4473. MN Sales Tax will be charged.